Have you often had an interest in fashion design or even shopping and looking at stylish clothes? Do you need an easy way to make some extra money to cover your rent or utility bills? Then you’ll be happy to learn that selling t-shirts online is a great way to add some extra cash to your wallet! As many as 2 billion t-shirts are sold every year worldwide so you’ll have plenty of company. You can easily make some money to add to your bank account by selling t-shirts from the comfort of your home. You can find a wide range of websites online that will help you make and sell personalized t-shirts. Nonetheless, you might be concerned with how hard it may be to make and sell these tees. How Hard is It to Design T-Shirts to Sell Online? Selling personalized shirts online is a great chance for you as a designer to get your foot in the door of the fashion industry. Also, selling your work is a bonus since it will put more money in your pocket! Here’s the best part: designing t-shirts isn’t restricted to artistic people so you don’t need a background in art education. You don’t even need to be super creative! Anyone can design, make, and sell shirts online. In fact, many t-shirt selling websites have their own platforms with user-friendly design tools. You can even get artwork directly from some of these platforms without needing to create your own original work. You will just need to drag and drop artwork in particular places on the shirts. Even if you don’t have any experience or education in design, you can still create some amazing t-shirts. If you aren’t comfortable making your own t-shirt because of your lack of artistic skills, you can always hire a designer using a bit of your own money. Looking for the Best Place to Sell Custom T-shirts Online? Check Out These Options! Finding the right place to design and sell your tailored t-shirts can be very complex and take up a bunch of time. 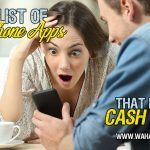 In order to save you that time, I have put together a useful list of some of the best websites to sell your t-shirt and make money online. Teespring is one of the most popular platforms online for selling t-shirts. This is mostly a crowdfunding and ecommerce website where you can buy or sell tailored t-shirts. The website works by allowing you to create your own t-shirts through a design section on a web page. Designing these tees is very simple and easy. You are first provided with a blank image of a white t-shirt. On the left and right side of the page, there are tons of different design options you can choose from. You can choose a color for your shirt. The site also lets you pick any of their own designs. If you go on this site to make a shirt, you’ll see that you can drag and drop artwork anywhere you’d like on the piece of clothing. It will take you no time at all to design your own customized tee. The next step will be to pick a price for your shirts. After designing, think about the price you’d like to sell your clothing at. Teespring lets you pick your own price, which makes it a very favorable platform. You will also want to set up a sales goal for your t-shirts. This will be the number of shirts you want to sell during your campaign. This is the smallest number of shirts you need to sell in order to have the shirts manufactured and printed. The bigger your goal, the more money you will end up with. There is a base price for making and shipping the clothing and the extra will be sent your way. So what you take home in your wallet will depend on your final selling price taking out the initial base cost of making and shipping the shirt. There are three options available on the Teespring website. If you choose a t-shirt with the website’s clip art and you sell it for $12, you will be able to take home $4.33 for every shirt you sell. That’s a good profit if you’re able to sell 20 or 30 shirts through the website. It’s up to you what price you decide on, but lots of sellers through the site price their products at around $19 or $20. Through this site, buyers will be able to reserve their t-shirts while your campaign meets its goal. If, for some reason, you don’t reach your campaign goal, the buyer will not have their card charged for the cost of the shirt. The last step in this process is to set up your campaign, which entails giving your campaign an eye-catching title and writing an engaging description about your product. You’ll also need to pick a length of time for your campaign. You can choose as little as three days to as long as 21 days. That’s all you need to accomplish. If you hit your target for selling t-shirts, the company will manufacture the tees and ship them off to your buyers. You will need a PayPal account to receive the profits from the t-shirt sales. Did you know you could create your own personalized online shop for clothes? CafePress allows you to do this! Check it out here. The website has plenty of professional-looking templates that allow you to customize clothes the way you see fit. Also, you can upload whatever graphics and HTML you like so your personal artwork can go on these shirts as well. You’ll be able to add whatever brands you like and organize the clothes in whichever fashion you want. You can set up your own sales and deals as well. It is a very flexible t-shirt selling platform that lets you tailor and personalize your products in whatever way you prefer. You can both make extra cash selling t-shirts through this site as well as use your own designs on more than 250 products sold through the platform. This website allows you to open up your own shop. So you will have to first create a store and upload the designs you plan to sell through your products and clothing. Next you’ll need to set up a price for your products. CafePress has a base price for each product and what you make past that is your profit to keep. The base price covers the cost of manufacturing your tees and shipping the product in the mail. You will need to make up a price that gives you enough profit after the sale as well as a price low enough to make it worthwhile for a buyer to purchase your shirt. You’ll be able to keep the profit after subtracting the cost of manufacturing and shipping. You’ll get to keep the commission after the sale. For instance, if the base price is around $11.99 and you sell the shirt for $18, you’ll make a profit of $6.01 for every tee you sell. Shipping your products anywhere on the planet. Fulfilling orders automatically. When a buyer puts your product in their cart, CafePress uses its print-on-demand technology and ships the product immediately. Taking most forms of payment including credit cards and PayPal. Choosing to display your designs and artwork on more than 250 different products. Taking care of all returns and refunds. No up-front costs to you. Making even more money using the CafePress Shop Performance Bonus program. Your buyers getting customer service from CafePress through email and a toll-free phone number. Your buyers should be satisfied with the products from CafePress. The vast majority of their products are of high quality. In fact, major organizations like UNICEF use the website to sell their own merchandise. Another great website you can use for manufacturing and selling t-shirts is Spreadshirt. Check the company website by clicking here! Buyers are happy with this site because the company offers very quick delivery and quality clothing. There are two options you will have: you can either set up your own shop through the site or sell through their global marketplace. You can use product markups, which entails adding a markup to the things you sell in your shop. You can also use a Design Price, which means you can upload your own designs and display it on your products when selling through your online shop. If someone else on the site uses one of your designs or if a product of yours sells, you’ll be able to make as much as $15 per item. You’ll get paid on the 15th of every month you do business through this platform. Also, you’ll need at least $10 in your account before you can withdraw any money. Another option for opening up your own store and selling t-shirts online comes from Logo Sportswear. This website is slightly different from the others because it focuses mostly on selling sports-related products and clothing. The site focuses on sportswear such as hockey jerseys. You can either use your own original artwork for the shirts you sell here or you can use the more than 13,000 free design options available through the company website. The company Logo Sportswear takes care of everything after you design the shirt. They will manufacture your product, bill the customer, and ship out your shirts. For every t-shirt that you sell, you’ll get 15 percent in commission. Here’s the best part: the website is completely free to use. You won’t have any start-up fees or monthly bills when running your online store through Logo Sportswear. 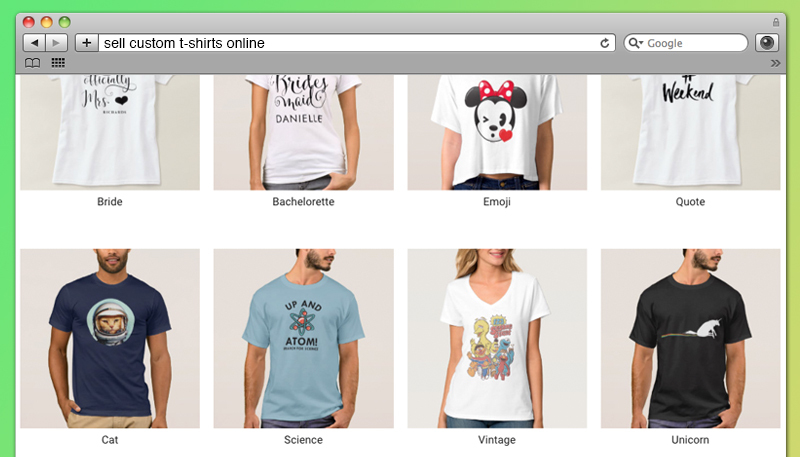 If you want a very user-friendly website to set up your own store for selling t-shirts, be sure to check out Zazzle. You can quickly and easily set up a store on the site and upload your artwork. You can use your own designs on t-shirts you sell through the online shop. You can also sell other customized products like mugs and pillows. This website is free to use when you sign up for an online shop. Your royalty fees through the site can be anywhere from 5 percent to as much as 99 percent. The only thing that may not work for you is the lack of clipart available through the site. You’ll need to use your own artwork and designs if you want to sell things through this company. If you don’t have your own designs, you may need to choose another platform for selling t-shirts. Another option is to hire someone else to design a great work of art for you. Or if you have a brand you want to use, plenty of artists and graphic designers could give you a hand. There are some other ways to make extra cash through Zazzle. You will need to first become a Zazzle associate and then begin sharing links of your preferred shops through your social media sites. You can also share products made by other people. The company PrintMojo allows you to sell all types of products including t-shirts that include screen-printed or embroidered imagery. These products are usually of high quality. Check it out here. You can get started with designing your t-shirts by first creating and then uploading your imagery and artwork. Then you choose whatever product you want it to be printed on, which is a t-shirt in this particular case. In this scenario, you will have to pre-order your t-shirts from this company at the wholesale price they request. You’ll need to order at least 25 t-shirts to meet the requirements of PrintMojo. This business will print and embroider your t-shirts in the style you request. All of the clothing will be put into a warehouse and PrintMojo will provide you with an online shop where you can resell the shirts. Then you will get a chance to add a markup or retail price for the products you’re selling. This will give you a profit you’ll get to keep. The markup price will make sure you get some more money in your pocket! Here’s the best part of PrintMojo: when a buyer puts your t-shirt in their online cart, the company handles all the processing and shipping. This frees up your time to other important things like making more designs and artwork. Every month, you’ll get payments from PrintMojo. You’ll get the profit from the markup price as well as some of the money you put into manufacturing the t-shirts. For every order, PrintMojo also deducts a fulfillment fee. The more t-shirts you order, the more you will likely make in the end. So be sure to check out this site too! One of the best things about selling t-shirts through the company SunFrog is the fact that you won’t need to hit any sales targets to get the shirts manufactured. There are no specific target goals to set up your initial campaign either. If you’re interested in selling your clothing through SunFrog, take a look at the website here. Some websites give you a short period of time to sell your t-shirts or meet a sales target goal. SunFrog, though, doesn’t have any time limit. You can sell your products for as long as you want through the site. You can either upload your own original artwork when making the t-shirt design or you can be an affiliate and use other people’s designs. The commission for being an affiliate is very fair so this is a great place to make plenty of money selling t-shirts. You can use the affiliate program by copying the URL link from the t-shirt that you’d like to sell and add your affiliate ID to the end of the link. Then you can begin sharing the new URL link all over your social media sites and your blogs. Essentially, you can share this link anywhere online. Every time someone clicks on your link, SunFrog begins tracking the session of the potential buyer. They keep track for up to two weeks. If the customer comes back over the next two weeks to buy the t-shirt through this website, you will get paid for it. In fact, if the buyer comes back but doesn’t immediately buy, their session will be renewed again for another two weeks. You are highly likely to get paid for every shirt bought after you share the URL across the Internet. In the affiliate aspect, the prices will be set by the designer of the t-shirts. The prices for t-shirts on this site varies anywhere from $19 to $35. 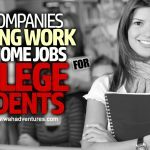 You could make as much as 65 percent in commission by being an affiliate on SunFrog. For every payment, you’ll need to have at least $50 in your account in order to get paid. There are multiple ways you can receive your money. You can choose either wire transfer, mailed check, or a PayPal transfer. For another excellent place to make and sell t-shirts, be sure to check out Gear Bubble! You’ll be able to set up a campaign easily and you don’t have to pay a dime to use the website. However, in order to sell through Gear Bubble, you will need your own designs. So you may need some artistic skills here. If you don’t have design skills, then you can hire a professional to make some type of artwork for you. If you don’t have design skills, then you can hire a professional to make some type of artwork for you. There will be a base price or flat fee that you’ll have to pay in order to have every t-shirt manufactured through Gear Bubble. Again, you’ll have to markup your price in order to make a profit. Despite the manufacturing fee, the company does not charge any other fees so your bills will not pile up by selling t-shirts through this site. You will keep all of your profit; the company won’t take any off the top. Gear Bubble handles all processing of payment from buyers as well as all of the manufacturing and shipping of your products. On top of it all, your customers will be able to receive customer support from Gear Bubble through phone and email. Another great benefit of this company is that you can sell other items with your designs. You can sell mugs, phone covers, hoodies, sweatshirts, and more. Everything you earn from your t-shirt sales once your campaign finishes can be withdrawn quickly. You’ll need to request this payment from the “Get Paid” page on the website. Remember that it takes several hours for the money you make from your t-shirt sales to appear in your account after your campaign ends. It will take about two weeks before payment is sent your way. Another great platform for your t-shirt sales could be Skreened, which features more than 100,000 designers and artists. Click here to learn more selling products on this website. You can join this website for free and open up an online shop for selling your clothing. When it comes to your commission price, the cap is at $10 and the company suggests picking a price around $4. If your commission is upwards of $4, then the Marketplace Optimization Adjustment (MOA) program of the site may impact the overall amount you can put in your pockets. To better understand the Marketplace Optimization Adjustment, click here. 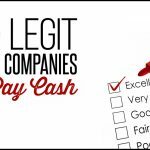 Be aware that your earnings may not be as high through this website as some other platforms available out there. Through this company, you can choose either a storewide commission or a design commission for your own individual store. Skreened will take care of all production of your t-shirts as well as shipping your products and customer service. There are some negatives about partnering up with Skreened, however. You will have to wait a long time before you get the money you made. You will get a commission or payment 45 days after a purchase has gone through. These 45 days involve processing and the time it takes to manage exchanges and returns. After the 45 days are up, the company takes another 10 business days before sending your payment directly to you. So if you don’t want to wait two months before getting paid, this may not be the best website for you. However, if you’d like to be part of a large website that manages thousands of artists, be sure to check out this company. If you’re looking to open up an online store for selling t-shirts and other products, Shopify is definitely something to consider. Shopify is an ecommerce business that offers software for online shops and point-of-sale systems in the case of retail. This company provides a ton of different tools for you to create your own online shop. You’ll be able to get a worldwide customer base with Shopify in less than an hour. However, you’ll need to work with a print-on-demand company since Shopify is solely responsible for software and does not offer you a resource for manufacturing the t-shirts you design. You’ll want to work with Gear Bubble or some other site that offers production of your t-shirts. Shopify doesn’t have any major fees that hurt your profit. Do you want to make full-time income solely from selling t-shirts? Shopify helps you turn selling t-shirts into a full-time business. There are some monthly fees for using Shopify. You will need to pay $29 for Basic Shopify, $79 for standard Shopify, and $299 if you want Advanced Shopify. If you’re not sure whether this is the right website for you, then you’ll be happy to learn you can still try it out to make sure. Shopify offers a 14-day free trial just for you! If you are knowledgeable on social media, then you’ve probably heard of Instagram. You likely know it as a site filled with gorgeous photography. However, Instagram is more than merely an image sharing website and a social media platform. The company Instaprints allows you to actually make money from the photos that you display on Instagram. If you use Instaprints, you can directly make money from the photos you upload to your Instagram account. You’ll need to put up the photos and designs that you want displayed on your t-shirts onto Instagram. Then you can sell those images printed on your tees through InstaPrint. Additionally, the company allows you to print these photos or images on other products such as pillows and phone covers. Any t-shirts you sell will be produced and shipped out by InstaPrint. You’ll be able to set up whatever price you’d like for your shirt. This means you can make as much money as reasonable. If you sell a handful of shirts, you could make $50 per design! RedBubble is another great option for selling t-shirts as well as other products displaying your designs. Take a look at RedBubble here. You’ll be happy to learn that t-shirts are the most popular product sold on this site, so you should be able to make some nice sales with this company. If you want to learn what kind of designs the company requires when creating t-shirts, click here. The company includes a base rate for producing its t-shirts. You’ll want to take a percentage of the base rate and add it to the manufacturing price so that you will make a profit on your sales. For instance, if the base price is $20 and you make your markup 10 percent of the base rate, then you’ll end up with a $2 profit for every shirt sold. On average, the website has a profit margin of 17 percent. If you don’t want to deal with production, shipping, or customer service, then you should choose RedBubble. The company handles all of these factors for you! For another site that handles production of t-shirts and shipping costs as well, consider the company Print All Over Me. Click here to learn how to sell tees through this site. PAOM Standard: A free plan where the site provides a number of plain, design-free items like t-shirts or backpacks. You can then upload your artwork for each item and offer your designs for sale. Every time someone buys your design, you get a 20 percent commision. PAOM Plus: This particular membership plan costs $15 per month and gives you permission to use PAOM plus silhouettes. You’ll be able to set up your own t-shirt costs and even put together discount codes for your tees. Other features include access to affiliate programs, edition products and campaigns. PAOM Pro: This membership will cost you $20 per month and provides you with the features of PAOM Plus along with custom labels. You can also add your own Spotify shop to this feature. It will cost you $75 to initially set up this platform. Printful is another print-on-demand company where you can make and sell t-shirts. However, you won’t be able to set up your own store through this platform. Printful let’s you integrate a store from another site with their own features. To learn more about it, click here. You can integrate with Shopify, Big Cartel, Gumroad, Bigcommerce, Tictail, and more. First, you will need to create a store on an ecommerce platform. Once all your products are listed there, you can set up a Printful account. You can connect your designs and products between the accounts. Printful can produce your t-shirts when a buyer orders your product. An order for a t-shirt is sent directly to Printful when the customer’s payment information goes through. The price of the shirt will have to be split between you and Printful. If it costs the company $20 to produce the tee and you charge the buyer $30, you will get to keep a net profit of $10 from the sale. All production and shipping of the shirts will be covered by Printful. Another great option for making and selling t-shirts is Print Aura. To check out this print-on-demand company, click here. This site also lacks a place where you can build your own online shop. Again, you can set up this account to link to an ecommerce platform where you can sell your t-shirts. There are lots of ecommerce websites that Print Aura can integrate with including Shopify, Storenvy, Opencart, Etsy, Bigcommerce, and more. When someone buys a shirt through your online shop, the buyer information and t-shirt order is sent directly to Print Aura. The Print Aura fulfills the manufacturing and shipping process. Your product will be made and then shipped while your customer gets full tracking information for their order. Also, you get the benefit of customized branding choices. Best of all, you won’t have any membership fees with this service. Try out Threadless if you want to make some money selling t-shirts quickly and easily. You can set up a new account and online shop in only minutes! You can personalize the online shop based on your own designs and preferences. You can add a customized logo, brand, and color scheme. Some of the benefits of Threadless include free hosting, font editor, site analytics, marketing resources, Mailchimp integration, and more! This site enables you to use drag and drop to design your t-shirts. Like other sites, Threadless handles all production of your products, shipping, and customer service assistance. The company TeePublic provides on-demand t-shirt printing along with a digital shop for your goods. You can open up your own store and sell your artwork on clothing. You’ll need to upload all your designs as PNG files. When everything is designed and ready to sell, your tees will go on sale for 72 hours through the site. Unfortunately, TeePublic doesn’t let you pick your own prices for your products. The two options are: $4 for full-price commission and $2 for sale price commission. All production and shipping is handled by TeePublic. You will get paid on the 15th of every month for all the t-shirts that you sell. Your payment will come in through your PayPal account. The website Design By Humans offers a ton of different products to their customers ranging from phone cases and posters to t-shirts and wall art. These products are sold to customers worldwide. This website first came on the scene in 2007 and allows designers from all over to take part. The way this site works is by offering designers a chance to apply and become a member of the Design by Humans community. Nonetheless, getting approved works relatively quickly, so this is nothing to worry about. Your online store can be activated within a day and then you can start uploading your designs. The commision rate on this site is $3 and you can’t set your own prices. The company has a newsletter and home page where they feature their designers. All production, payment, and shipping is handled by Design by Humans. If you have lots of experience as a designer and you want to sell t-shirts online, NeatoShop is a great option. This site looks specifically for high-quality and artistic pieces. To sell your designs through this website, you will need to send your portfolio of designs to the email address info@neatoshop.com. The company needs to approve your designs before you can sell them. However, if you’re not a designer, you can still make money through this site as an affiliate. You’ll need to spread the links throughout your online media pages and blogs. 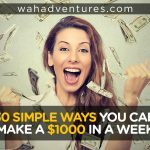 Then you can get paid each month with a commission for each sale. If you have a quality website, you can become an affiliate at NeatoShop. You can create your own online shop through Tostadora. There are no fees to do so. You can sell t-shirts along with other products featuring your artwork through Tostadora. This company will handle all production of your products, shipping, managing any issues with delivery, and all potential exchanges. You can set your own price for your products through this company. You’ll want to have a price higher than the base amount for making the product. That way you’ll make a profit. You’ll get paid quarterly when selling shirts through this company. Click here to check out the Tostadora website! If you’re looking to open up an online store for free, you should also check out the TShirt Mill. The store you open up can be completely tailored and personalized to your own brand and the look you want to portray. This website has lots of great tools you can use including a shopping cart, social media integration, design tools, user-friendly templates, Google Analytics, and more. When you finish your designs and upload them, you can place them on a wide variety of products available through the website’s catalog. You can set your own prices for your t-shirts. 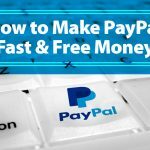 You’ll receive money through PayPal every month for each sale. Another great place where you can easily sell some t-shirts you’ve designed is through CustomCat. This company can actually ship your products in only two or three days after a buyer purchases your t-shirt. If you have a Shopify account, you can integrate it quickly and easily with CustomCat to make sure your products are sent directly to your customers. You can also sell caps, polo shirts, jackets, and bags through this site. Besides clothing, you can add your designs to mugs, jewelry, cell phone cases, and hairbrushes as well! Here’s the best part: CustomCat offers the best prices in the industry and even gives you a 14-day free trial. While these websites are great in your effort to open up an online shop and sell your goods, there are some more steps you can take to make sure your t-shirts sell in big numbers. You can let your friends and followers know through social media. You can create a target niche such as selling sports paraphernalia or designs geared toward motherhood. Most of all, you should make sure your designs are eye-catching and attractive. Have you sold any t-shirts online before? 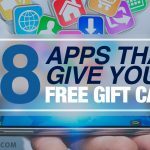 Have you used any of these websites? How did it go? Let me know by commenting below! Update your info! PruintMojo is out of biz!